Thanks to a poke from Kneyda on Ravelry, I'm finally posting to the blog. 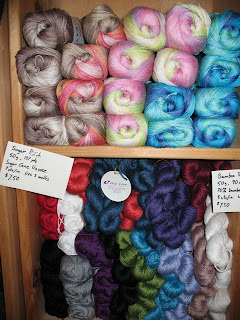 As promised, here are the new spring yarns. 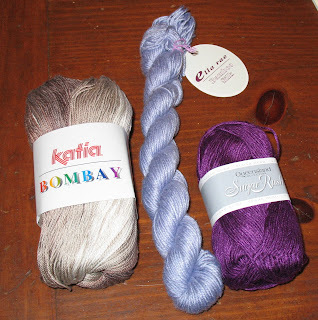 From left to right, we have Katia Bombay which is a sport weight, mercerized, self-stiping cotton. I got it to replace the discontinued Katia Jamaica which turned into Big Niece's Christmas dress. The next one is Bamboo Silk from Ella Rae. It is really soft and, according to Annie, has a great hand. (I'm making that Annie knit all the samples.) The last one is Sugar Rush. It is made with sugar cane! How fun is that?! It is very slippery and drapy but super shiny. I'm really happy with these yarns. I already need to order more of the Bombay. The colors are gorgeous and I've set some aside to make a baby dress for a friend. Can't wait to try it!